Developed parametric characterization tester for a mixed-signal ASIC used in a solar micro-inverter. LabView drivers and a TestStand sequence, with subsequences, were developed for 15 measurements using 27 chip configurations over voltage and temperature limits. 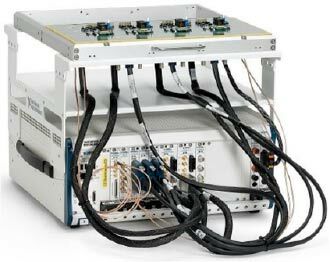 PXI hardware consisting of an 18-slot chassis with ARB, Scope, HSDIO, DMM, MUX, Relay, Analog Out cards was used with GPIB interface to the thermal test head and external modular power supplies.